The classic Cane Barrel Chair…Timeless. One of those pieces that was just as relevant in home decor 100 years ago as it is today and with a little tweak here and there, you can have a furniture piece that will go with almost any decor. Why it Works; Great lines, open weave and the tufted back add to it’s fabulous style, while it is designed perfectly for comfort. When left in its natural wood tones and velvety fabrics, the cane barrel chair is right at home in a Traditional, French Country or English Country home. 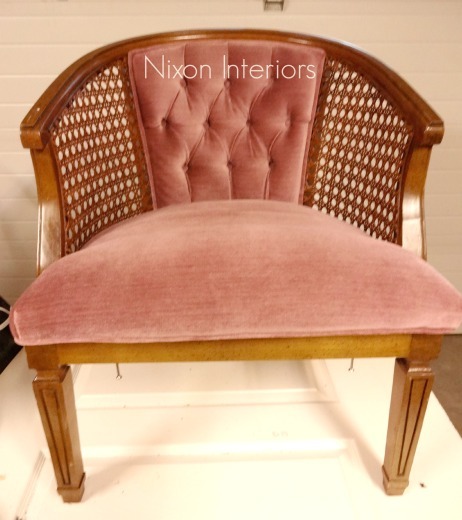 But if your looking for something a little different, check out how one chair can have very different looks. This beauty was redone in a neutral, highly textural beige fabric. The frame was painted in an earthy white called Etiquette by Benjamin Moore. Why it Works; Nothing says easy, breezy, beautiful like Covergirl and woven cane. The open airy feel instinctively makes us think of tropical beaches, sunny days and light breezes. Other fabric choices that would work well for this look would be twills, cottons and linens. 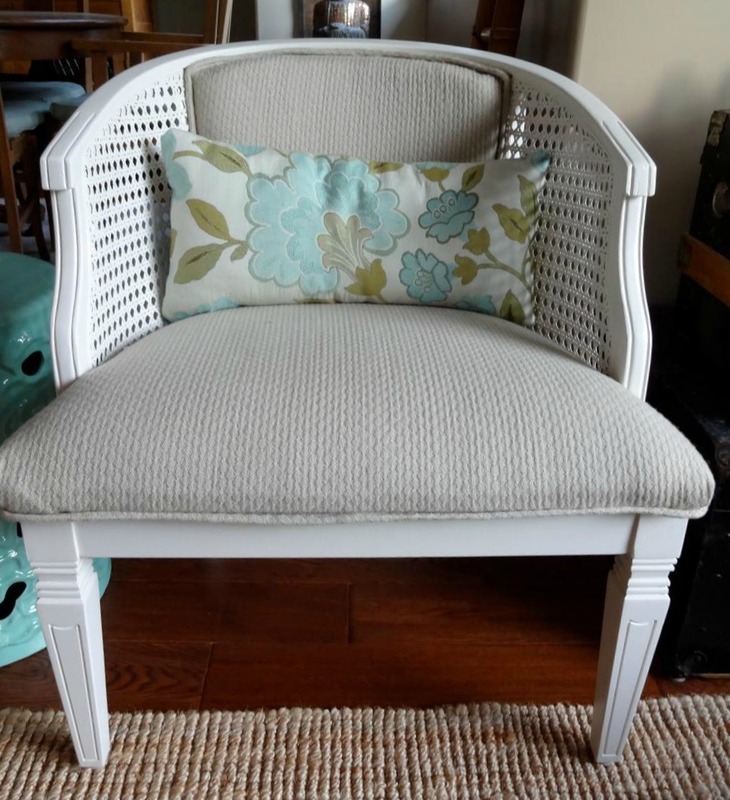 Totally relaxed in feel, this chair would love to chill out in a casual, cottage or nautical setting. 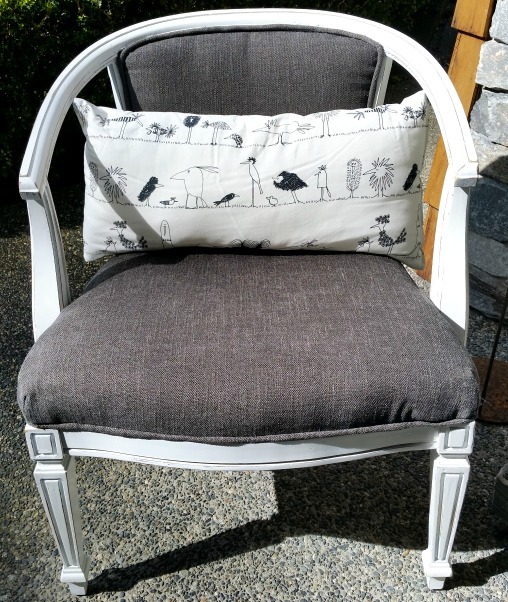 To see how I transformed this chair, have a look at my post Chair Redo. Same style of chair, but completely different look. Painted in a high gloss black and ever so slightly distressed to add an aged patina. 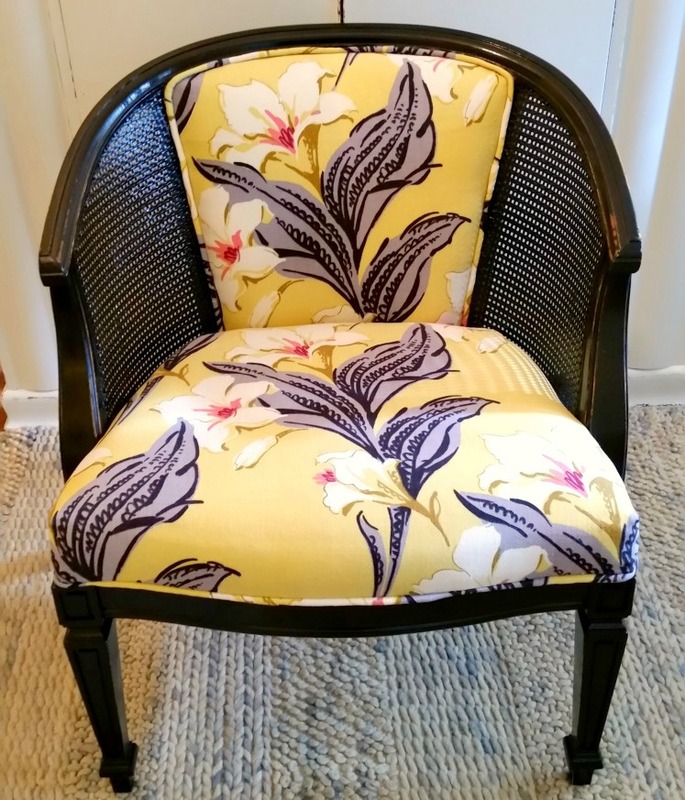 This chair was covered in a fantastic vintage floral print that I scored from a friend. Always nice to have friends with style! Why it Works; While its counterpart above was happy making a cool and casual entry, this chair is a little more Diva and demands attention in any room, just by simply – being. This lovely gal would be sitting pretty in a hollywood glam, art deco or a contemporary setting where a pop of colour is just the thing. The caning on this chair was in rough shape so rather than paying for the sides to be redone, I simply popped them out. This alone, transforms the look of the chair quite drastically. Going for a bit more of a rugged look, I painted the chair in a high gloss white and then heavily distressed every angle of the wood frame. Keeping with a masculine feel, I recovered the seat and back in a heavy two tone grey material. Why it Work; By removing the cane sides and the button tufted back, this chair instantly becomes more contemporary. The heavily distressed wood and weighty fabric create a masculine feel that more than carries its own weight in any room. This handsome hunk of wood would be look’n fine in a masculine, industrial or rugged contemporary decor. When in doubt, Be Brave! Your reward will be a fantastically classic chair that with a little lovin’, is happy making a statement in any home.